What Is DA Form 67-9? DA Form 67-9 or Officer Evaluation Report is a form used in the Officer Evaluation Process. This document contains all information about the rated officer's competence, physical and mental condition, leadership abilities and their potential for promotion. DA 67-9 is universal for any rank of the rated and the rater. 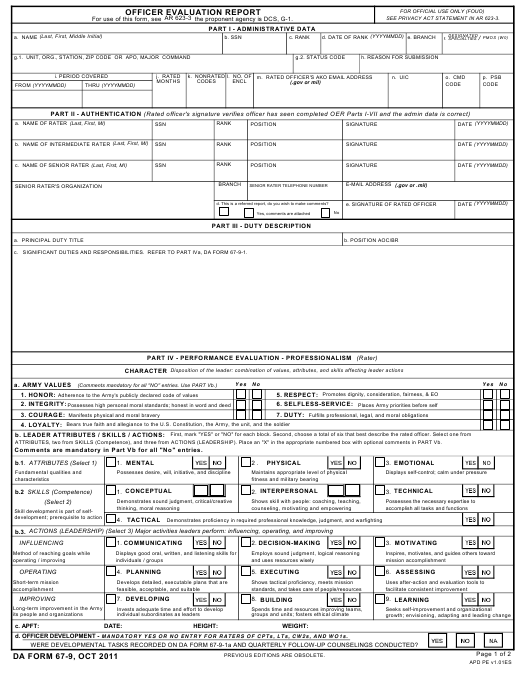 This particular form has replaced the outdated DA Form 67-8 (US Army Officer Evaluation Report). The October 2011 edition of the report was the last one released by the Department of the Army (DA). An up-to-date non-fillable version of the DA 67-9 is available for download below. The form - sometimes referred to DA Form 67 for short - should not be confused with the DD Form 67, Form Processing Action Request. The latter is used to request a revision or cancellation of any existing DD form or to add a new one to the DoD inventory. ; the proponent agency is DCS, G-1. SEE PRIVACY ACT STATEMENT IN AR 623-3.
d. This is a referred report, do you wish to make comments? c. SIGNIFICANT DUTIES AND RESPONSIBILITIES. REFER TO PART IVa, DA FORM 67-9-1. ATTRIBUTES, two from SKILLS (Competence), and three from ACTIONS (LEADERSHIP). Place an "X" in the appropriate numbered box with optional comments in PART Vb. Comments are mandatory in Part Vb for all "No" entries. d. OFFICER DEVELOPMENT - MANDATORY YES OR NO ENTRY FOR RATERS OF CPTs, LTs, CW2s, AND WO1s. WERE DEVELOPMENTAL TASKS RECORDED ON DA FORM 67-9-1a AND QUARTERLY FOLLOW-UP COUNSELINGS CONDUCTED? b. COMMENT ON SPECIFIC ASPECTS OF THE PERFORMANCE, REFER TO PART III, DA FORM 67-9 AND PART IVa, b, AND PART Vb, DA FORM 67-9-1.
c. COMMENT ON POTENTIAL FOR PROMOTION. CATEGORY CPT ALSO INDICATE A POTENTIAL CAREER FIELD FOR FUTURE SERVICE. d. LIST THREE FUTURE ASSIGNMENTS FOR WHICH THIS OFFICER IS BEST SUITED. FOR ARMY COMPETITIVE CATEGORY CPT, ALSO INDICATE A POTENTIAL CAREER FIELD FOR FUTURE SERVICE. Beginning April 1, 2014, the U.S. Army will change their officer evaluation reporting system to a new format to analyze and rate officer performances in a manner more in line with Army doctrine, switching form DA 67-9 series to the DA 67-10 forms. The report itself is prepared by the rating chain, which includes the rater and the senior rater. Sometimes an intermediate rater may take part in the evaluation process. The procedure includes supervision sessions, written descriptions of the soldier's duties, a performance assessment and a face-to-face interview. The completed will be forwarded to the Department of Army Headquarters (HQDA). A supporting form - DA 67-9-1 - is used during the preparation of the report. The rated officer has to fill it out with a description of their duties. The DA Form 67-9-1 will not be forwarded to the HQ since it is used only as a medium for preparing the Officer Evaluation Report. DA Form 67-9-1, Officer Evaluation Support Form is used to assist the raters in preparing the report. The rated officer will receive a copy of this form at the beginning of the rating period. Their responsibility is to verify their participation in a face-to-face discussion by signing Part III and to fill out Parts IV and V.
The officer must describe their duties and responsibilities, significant contributions and any skills and abilities valuable to their service and position. This form is supposed to promote a top-down emphasis on leadership communication, integrating the rated officer into performance counseling and the evaluation process. DA Form 67-9-1A, Developmental Support Form is mandatory when evaluating captains, lieutenants and warrant officers. The DA 67-9-1A is optional when evaluating officers of other ranks. This document contains the results of face-to-face discussion and the developmental plan that targets leadership skills. This Support Form will later be used during the follow-up counsellings of the rating chain. The general purpose of this form is to assist junior officers in their transition into Army leadership culture.